Experiencing a persistent feeling of itching can be a nightmare for a woman, especially if she is not able to pinpoint the exact cause. While urticarial, or hives, are mostly related to allergic reactions, there are other conditions that could be causing the sensation of itchy, creepy, or crawly bugs on her skin. Many women, especially those undergoing certain delicate periods of their lives, complain about feeling the skin itching constantly and are at a loss on how to find relief, or at least make sure the constant scratching doesn't end up in open wounds or permanent scars. Fortunately, it is not necessary to let the problem progress to such a point. There are ways to manage itchy skin and find the appropriate relief. Continue reading to learn about itchy skin causes; risk factors; symptoms and signs; prevention; and treatment options. Women with chronic dry or itchy skin tend to show signs of aging (such as wrinkles) earlier than women with oily skin. While sometimes blamed on allergies like dermographism, many cases of dry and itchy skin are related to lack of collagen. People with a tendency to have dry skin may find they need to avoid extreme weather conditions, direct sunlight, and even certain moisturizing creams. 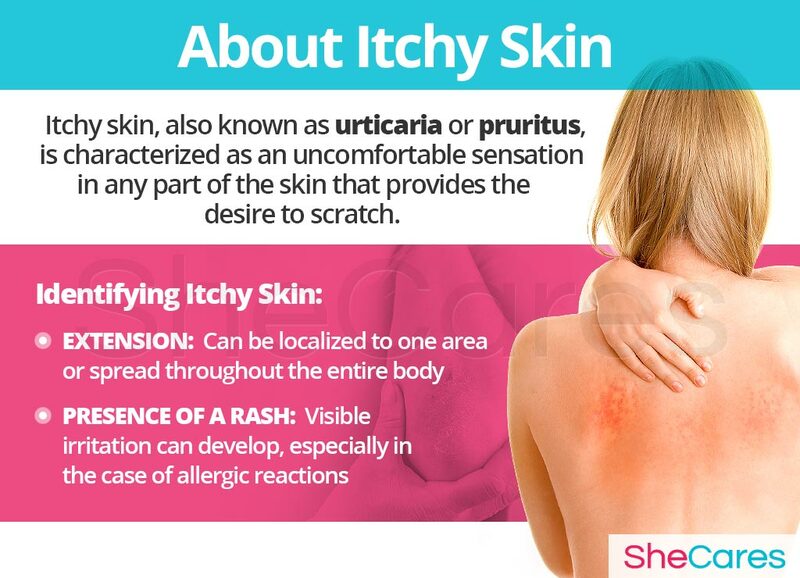 Itchy skin, medically termed urticaria or pruritus, is an uncomfortable sensation in any part of the skin that provokes the desire to scratch. Sometimes, this feeling may be so strong and intense that it may interfere with daily activities or lessen the quality of a woman's sleep. Itchy skin is not usually one of the first symptoms that come to mind when thinking of hormonal imbalance. However, it is quite common during pregnancy - particularly during the last trimester - and during the years leading up to menopause. Some women even report feeling pruritus or paresthesia - “pins and needles” - more frequently or more strongly during the final week of their menstrual cycles. For the general population, pruritus or itchy skin may be classified according to two different criteria: its extension and the presence of a rash. In the case of pregnant women, there are two additional specific types of itchy skin that they should watch out for. In order to understand the processes behind itchy skin, continue on to the next section to read about their hormonal and non-hormonal causes. Learning about the causes of itchy skin provides the key to understanding how to prevent and treat this troublesome symptom. 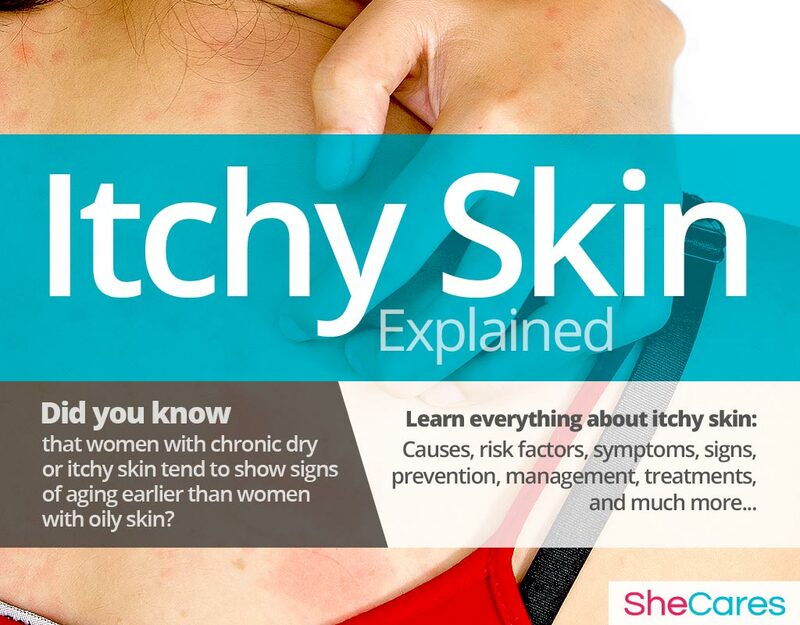 While the exact causes behind itchy skin are complex, many experts agree that a large part of the issue rests with the hormonal fluctuations that women undergo during their lives. In addition to these completely normal hormonal causes, other factors and medical conditions can, in more rare instances, cause itchy skin. Continue reading to learn more about hormonal and other causes of itchy skin. Hormones are chemical messengers that control every organ in the body. When fluctuations occur, organs don't receive the correct signals to function adequately. So, hormonal disorders occur. 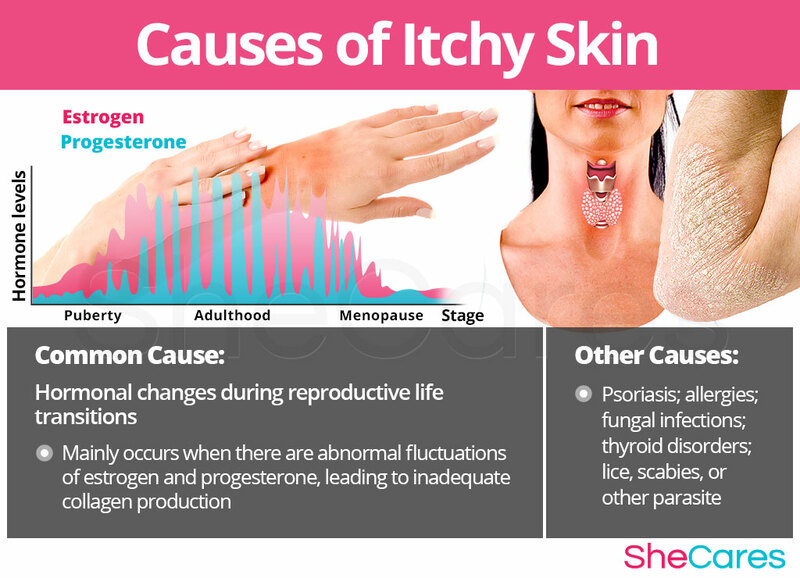 In this sense, we can say that itchy skin is caused largely by the hormonal fluctuations during the transitions women go through during their reproductive life. The hormones estrogen and progesterone influence the production of collagen, a protein that works as the body's elastic glue and keeps several kinds of tissues young and healthy looking, including muscles, tendons, and skin. Medical researchers have found that fluctuating levels of hormones, particularly estrogen, make women more prone to produce inadequate amounts of collagen. Collagen is not only responsible for keeping skin moist and for delaying the appearance of “crow's feet” and general signs of aging, but for keeping the joints and muscles - including the vaginal ones - elastic and strong. Insufficient amounts of collagen can cause dry patches of skin all over the body; it affects the skin's ability to sooth itself after being in contact with any kind of irritant and may cause the itching and the “bugs crawling” sensation due to affected nerve endings on the surface. Hence the reason why more women experience bouts of itchy skin during times of significant hormonal imbalance. The estrogen deficiency during these stages causes levels of collagen to change. If hormone and collagen levels are not regulated, women may experience itchy skin as well as many other skin symptoms. Furthermore, there are also specific hormonal causes and typical environmental factors which can influence a woman's experience of itchy skin according to the stage of her reproductive life in which this disorder appears, such as during puberty, pregnancy, post-partum, and menopause. Puberty is the stage in which a girl's body begins to produce reproductive hormones; these and other factors, such as allergies and acne, contribute to itchy skin during puberty. Pregnancy leads to extreme changes in the production of reproductive hormones, which can produce itchy skin disorders like PUPPPS or combine them with other related disorders like melasma. Post-partum and breastfeeding is another stage where reproductive hormones are imbalanced leading to symptoms like itchy skin. Also, other factors contribute to the disorder during post-partum, such as lack of self-care and healing from PUPPP. Menopause is the stage in a woman's life when production of reproductive hormones naturally declines, signaling the end of a woman's fertility. As well as hormonal cases, other factors add to the reason for itchy skin during menopause, including the natural aging process. While hormonal imbalance is the major underlying cause of itchy skin during a woman's reproductive life, experts also point out that itchy skin may be caused by other less common underlying conditions, including psoriasis, allergies, or thyroid disorders. Keep reading to learn about which risk factors and triggers have a profound effect on a woman's experience of itchy skin. Some women are more likely than others to suffer from itchy skin for inherent psychological, behavioral, and health reasons. These predisposing factors can affect a woman's hormone levels and increase her chances to develop itchy skin as a result of hormonal imbalance during her reproductive life. Continue reading to learn about the triggers of itchy skin. In addition to long-term risk factors, itchy skin can also be triggered by certain environmental phenomena or immediate events. Avoiding these environments or habits as much as possible may help to avoid the onset of the symptoms. These include accidental events like insect bites and skin-drying habits like excessive steamy showers. Continue reading to discover the symptoms and signs of itchy skin as well as guidance for its diagnosis. To diagnose and identify the symptoms of itchy skin, a doctor must typically perform three procedures. First, they should review the patient's medical history; then, they should conduct a physical exam followed by some additional tests, if judged necessary. In rare cases, itchy skin can be a sign of a more serious underlying condition instead of hormonal imbalance, and will require a doctor's evaluation in order to avoid complications. However, it is important to remember that in the majority of cases, itchy skin will not require any serious medical intervention. Any potentially more serious underlying cause for skin problems will usually present additional symptoms that should act as a warning, such as uncommon persistence or changes in weight or bowel function. Women who experience frequent and severe skin rashes may wish to treat or even prevent them. Keep reading below to learn how to prevent and manage itchy skin. While there is no single way to completely prevent itchy skin, there are a few steps that a woman can take to lessen her chances of developing severe flare ups or to minimize the impact or length of time that symptoms occur. Lifestyle changes for prevention are extremely important, especially in regard to diet, exercise, and healthy habits. Moreover, a woman may see ways to complement these lifestyle approaches with the use of supplements that help to enhance the endocrine system and, therefore, help to prevent or ease symptoms of hormonal imbalance such as itchy, dry, or irritated skin. Continue reading to learn more about lifestyle changes for prevention of itchy skin. For women who are already going through the disorder, prevention may no longer be possible. Fortunately, there are many ways to manage the problem in order to prevent the flare-ups of itchy skin or to lessen its intensity when it does appear. Keep reading to learn about the different ways to manage itchy skin. Wherever you happen to be when experiencing an attack of itchy skin, there are effective ways to manage the symptom. Making minor daily changes and avoiding triggers can make a huge difference for women who are trying to manage itchy skin. Alternative treatments can also provide great short-term relief for itchy skin. These treatments will not tackle the underlying hormonal cause behind itchy skin or lack of collagen, but they can reduce the intensity of the symptoms. Alternative treatments include moisturizing masks or acupuncture. While these measures often help to reduce the frequency and intensity of symptoms of itchy skin, they are unable to treat the root of the problems, which is hormonal imbalance. However, there are several natural treatments that can treat the hormonal causes of itchy skin. Please continue to the next section to learn more about treating itchy skin. While itchy skin sometimes has an obvious cause, there are cases when the underlying cause is less obvious. No matter the cause, there are simple home remedies to stop itchy skin and start the healing process, such as using a humidifier and applying ice packs. 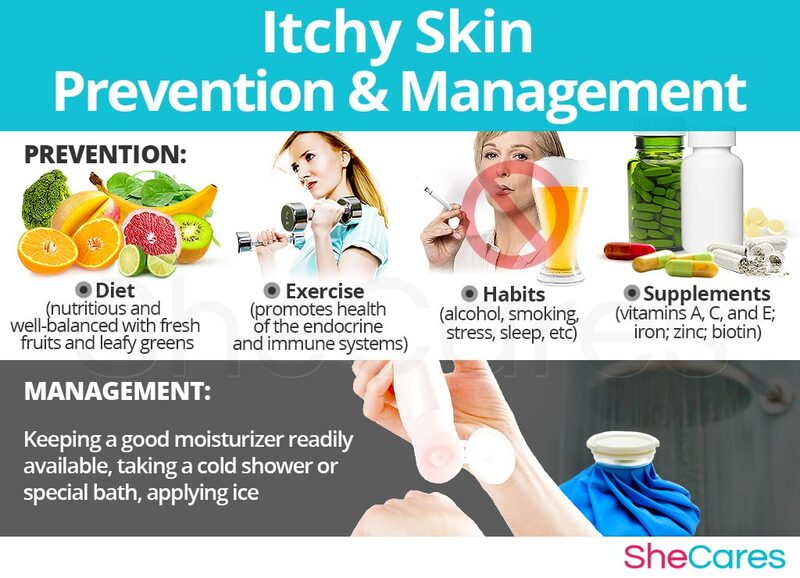 If you tend to have dry and itchy skin, you may be looking for ways to manage it so that it will not interfere with your daily life or with sleep. An example of one way to reduce itching is to wear loose cotton clothing. Itchy skin can be a very persistent, disturbing symptom. Luckily, women don't have to suffer from it indefinitely or just “bear with it” because there are several types of treatment available. Three levels of approaches can be considered for treating itchy skin. These are categorized as: (1) Lifestyle Changes, (2) Alternative Medicine, and (3) Pharmaceutical Options. Women are encouraged to begin with the least risky approach to itchy skin treatment, lifestyle adjustments. While these are often effective at curbing the disorder, they alone do nothing to address the most common cause of itchy skin in women, hormonal imbalance. Fortunately, alternative medicine can be combined with lifestyle changes to provide a safe and effective itchy skin treatment. While medical intervention is not usually necessary to treat itchy skin, some women may wish to consider drug options if they are unable to find relief from natural treatments. For women considering this option, it is important to understand, and carefully weigh, the risks associated with this course of treatment. This primary level of treatment involves the least amount of risk, though conversely, it requires the highest amount of self-discipline. Many times some simple changes in lifestyle can reap huge benefits in fighting itchy skin and achieving a higher overall level of health. 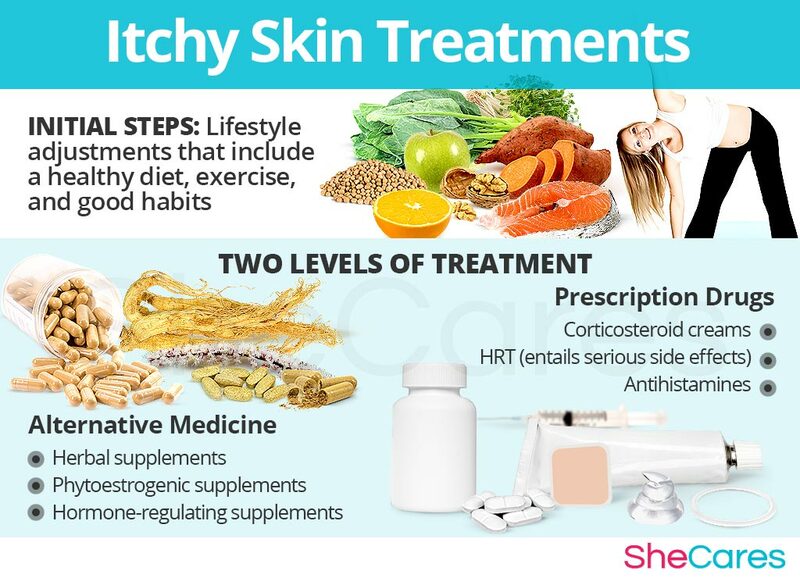 Fundamentally, an improved diet, regular exercise, and healthy habits go a long way in helping women get rid of the uncomfortable itchy skin attacks. While these changes will help alleviate itchy skin, they do not address the problem directly at the hormonal source, and so, further treatment may be necessary. Alternative medicine has proven to be excellent for treating itchy skin in a safe and natural way. Alternative approaches involve little to no risk and can be an extremely effective way to treat itchy skin. In the case of herbal supplements, there are two main types that can be used: phytoestrogenic and hormone-regulating herbal supplements. These supplements, such as gingseng, contain plant-made compounds that are very similar to human estrogen, that can replace the missing estrogen from a woman's body and, thus, directly address the underlying hormonal deficiency behind dry, itchy skin. These types of supplements, like Macafem, don't contain any specific outside hormones. Instead, they nourish the endocrine system as a whole, allowing it to resume normal hormonal production. This ultimately results in balancing not only estrogen, but other important hormones such as progesterone. These supplements can be considered the safest and most natural way to treat the underlying hormonal imbalance behind itchy skin and can be taken throughout a woman's life as they support the body's natural hormone production. Additionally, there are some other types of supplements that can also alleviate itchy skin, or at least tone down its severity. This includes vitamins and other herbal supplements. A combination of approaches is usually the most effective route to take. Lifestyle changes combined with alternative medicine will most likely be the best way to alleviate the symptoms of itchy skin. However, for some women, the symptoms will be so severe that a more drastic treatment is necessary. Interventions at the third level involve the highest risk and often the highest costs. Not all treatments are suitable for women at every life stage. So, it is strongly recommended to speak to a licensed healthcare practitioner before starting any pharmaceutical treatment for dry or itchy skin. There are three main types of pharmaceutical options that can be described to treat itchy skin: hormone-regulating medication, anti-itching medication, and light therapy. Love, S. (2003). Menopause & Hormone Book. New York: Three Rivers Press.